As I was flipping through the February 2014 issue of the American Historical Review I was encouraged to see that American historical profession’s flagship journal seems to be doing a pretty decent job of publishing the impressive work of female historians. Three out of its four main articles were written by women and four out of the five books in its “Featured Reviews” section were also by women. That’s encouraging. But what about the rest of the February issue? Figuring out how many women are in the 176 contributors for this single issue is a lot harder. And what about not just this issue, but all five issues it publishes annually? And what about not just this year, but every year since its inception in 1895? Looking at gender representation in the American Historical Review is exactly the kind of historical project that lends itself well towards digital analysis. Collecting individual author information from 120 years of publication history would take an enormous amount of tedious labor. Fortunately the information is already online. I wrote a Python script to scrape the table-of-contents from every AHR issue and then, with the help of Bridget Baird, began to process all of this text to try and extract the books that were reviewed in the AHR, their authors, and the names of the person reviewing them. The data was something of a nightmare, but we were eventually able to get everything we wanted: around 60,000 books, authors, and reviewers. The challenge turned to: was there a way to automatically identify the gender of all of these different people? Especially for a dataset that spanned more than a hundred years we needed a way to take into account potential changes in naming conventions. A historian named Leslie who was born before 1950 was likely to be a man, but if that same Leslie was born after 1950 the person was likely to be a woman. Bridget’s solution was for us to write a program that relies on a database of names from the Social Security Administration dating back to 1880 to account for these changes. This approach is not without problems. It only includes American names while subtly reinforcing an insidious gender binary framework. Nevertheless, it does contribute a useful new digital humanities methodology and one that we are planning to explore with Lincoln Mullen in more depth. This might come as a real shock, but the American Historical Review didn’t feature very many women for much of its publication history. Over the first eighty years of the AHR‘s existence there were rarely more than a handful of books written by female authors in any given issue – as a percentage of all authors, women made up less than 10% of reviewed books through the 1970s. 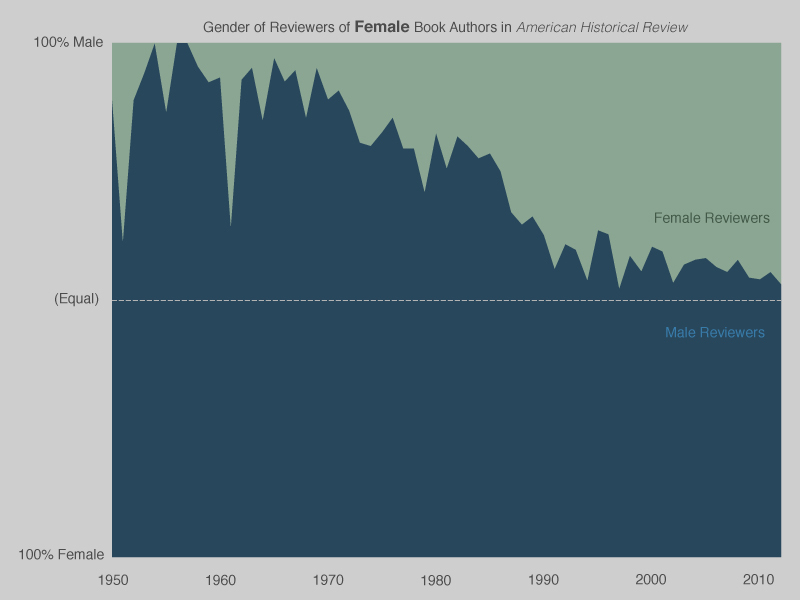 But things began to change in the late 1970s, when female authors began a steady ascent in the AHR‘s reviews. By the end of the 1980s women’s books had nearly doubled in the journal. By the twenty-first century there were three times as many women as there had been in the 1970s. 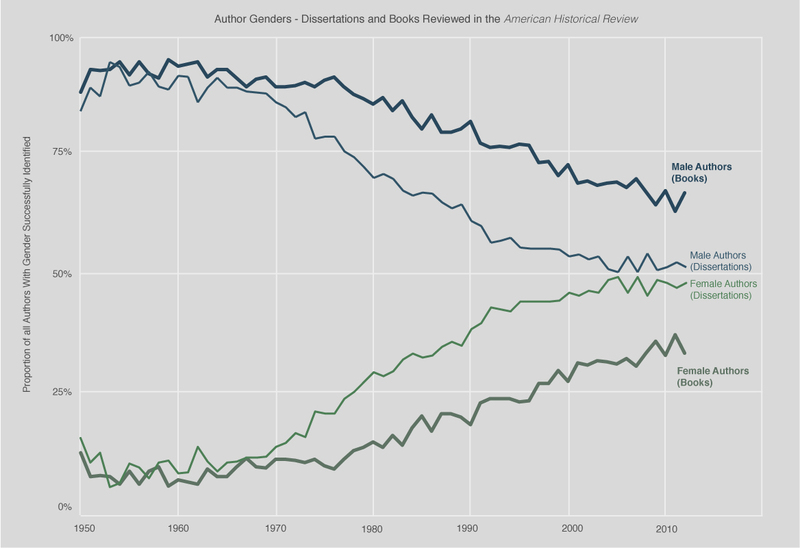 Gender of book authors (as a percent of all authors) in the American Historical Review between 1895 and 2013. The number of authors categorized as “Unknown” in the early years stems from the widespread use of initials (ex. K. T. Drew). Most of these authors were likely men, but we’ve erred on the safe side in categorizing them as Unknown. In the later years, many of the “Unknowns” stem from non-U.S. names. But other numbers paint a less rosy picture. 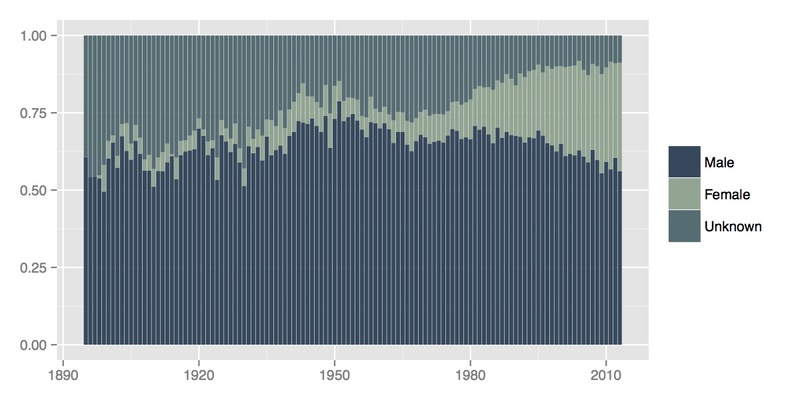 Lincoln Mullen’s recent work on history dissertations showed a similarly steady upwards trajectory in the number of female-authored history dissertations since 1950. Although it has plateaued in recent years, women have very nearly closed the gap in terms of newly completed history dissertations. But the glass ceiling remains stubbornly low in terms of what happens from that point onwards. In book reviews published in the AHR male authors continue to outnumber female authors by a factor of nearly 2 to 1. 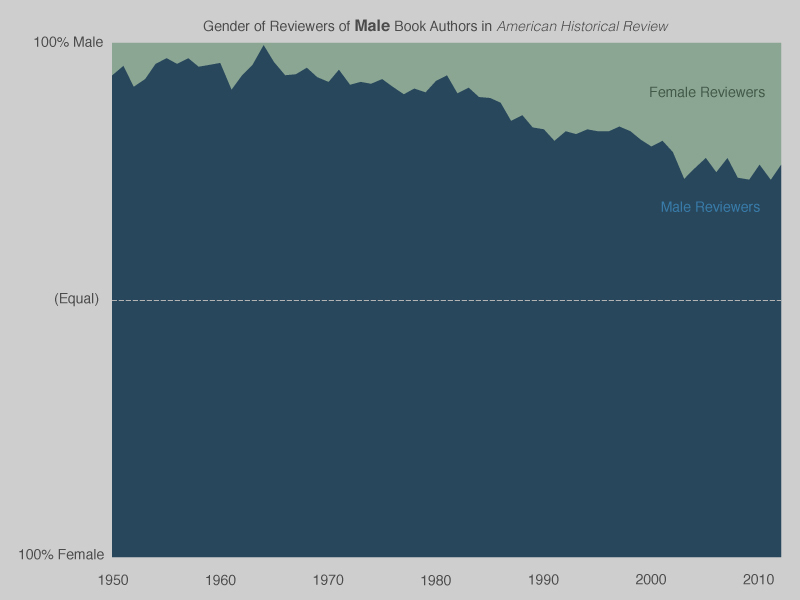 Whereas there is now a gap of around 3-5% separating the proportion of male and female dissertation authors, that gap jumps to 25-35% in terms of the proportion of male and female book authors being reviewed in the American Historical Review. Gender of dissertation authors and of book authors in the American Historical Review. Note: The above chart only looks at authors whose gender was successfully identified by the program. It is also something of an apples-to-oranges comparison given that Lincoln and I were using slightly different methods, but it gives a rough sense for the gap between dissertations and the AHR. On the reviewer side of the equation, things aren’t much better. There are still more than twice as many male reviewers as female reviewers in the AHR. But gender inflects this relationship in less direct ways. In particular, we can look at the gender dynamics of who reviews who. About three times as many men write reviews of male-authored books as do women. In the case of female-authored books, there are slightly more male reviewers than female reviewers but the ratio is much closer to 50/50. In short, women are much more likely to write reviews of other women. And while men still write reviews of the majority of female-authored books, they tend to gravitate towards male authors – who are, of course, already over-represented in the AHR. Gender of reviewers for male-authored books. Note: The above chart only looks at authors and reviewers whose gender was successfully identified by the program. Gender of reviewers for female-authored books. Note: The above chart only looks at authors and reviewers whose gender was successfully identified by the program. Bridget and I were also able to extract the subjects used by the AHR to categorize their reviews. Although these conventions changed quite a bit over time, I took a stab at aggregating them into some broad categories for the past forty years. Essentially, I wanted to find out the gender representation within different historical fields. As you can see in the chart below, the proportion of men and women is not the same for all fields. Caribbean/Latin American history has had something approaching equal representation for the past decade-and-a-half. In both African history and Ancient/Medieval history female historians made some quite dramatic gains during the late-nineties and aughts. The guiltiest parties, however, are also the two subject categories that publish the most book reviews: Modern/Early Modern Europe and the United States/Canada. Both of them have made steady progress but still hover at around two-thirds male. The different subjects are sorted left-to-right by the number of reviews in the AHR. Again, please note that the above chart only looks at authors whose gender was successfully identified by the program. Women are now producing history dissertations at nearly the same rate as men, but the flagship journal of the American historical profession has yet to catch up. There are, of course, a lot of factors at play. This gap might reflect a substantial time-lag as a younger, more evenly-balanced generation gradually moves its way through the ranks even as an older, male-skewed generation continues to publish monographs. It might reflect biases in the wider publishing industry, or the fact that female historians continue to bear a disproportionate amount of the time-burden of caring for families. That the AHR continues to publish far more reviews of male authors than female authors is depressing, but unfortunately not surprising given the systemic inequalities that continue to exist across the profession. I would expect that there would be a time lag between the trend in publishing theses and publishing books. The African and Ancient/Medieval statistics show an interesting spike in books written by women which were reviewed some time in the recent past but the pendulum has now swung towards reviews of books written by men. It is not possible from these graphs to tell in which years more than 50% of reviews were by women or what caused these fluctuations. Were there a small number of women who dominated the field in this period who are no longer writing? Was it a particular research institution or cluster of research institutions who were supporting these female researchers? Why has the pendulum swung back to male authors receiving more reviews in these fields? You have provided so much data which of course sparks so many more questions. I have done a much more limited analysis of reviews in three Australian academic history journals. Over two years I found that two journals are reasonably close to parity but one, a journal which concentrates on politics, was significantly behind the others. An historian who has worked with this journal has pointed out to me how multi-faceted and deep-seated these issues can be. She also wondered if the history of international relations is dominated by men. It is very difficult to go through the data on book reviews and identify the types of topics that are covered by the books reviewed but this is another way of analysing the data. It would be interesting to have a look at your data just focussing on the last ten years as these are the trends that current editors of book review sections have some control over. We can do something about this but the issue also needs to be addressed in universities as this has a flow-on effect to books written and reviewed. Thanks so much for the comment, Yvonne! And thank you for sharing the link to your own analysis of Australian history journals – the gender ratio in History Australia and and Australia Historical Studies seems particularly impressive, comparatively. I’d be really interested to know if there are systemic differences in gender representation for historical professions in different countries. I thought of the same thing about the time lags, but even if you take into account the typical “lag” between a dissertation and publication (and then another lag between publication and review), the AHR still doesn’t close the gap. As for the subjects, I’ve tried not to read too much into short-term fluctuations just because it might be noisy data rather than a meaningful shift. This is especially true for subjects on the left side of the chart, where there just aren’t that many reviews published each year in comparison to, say, Europe or US fields. 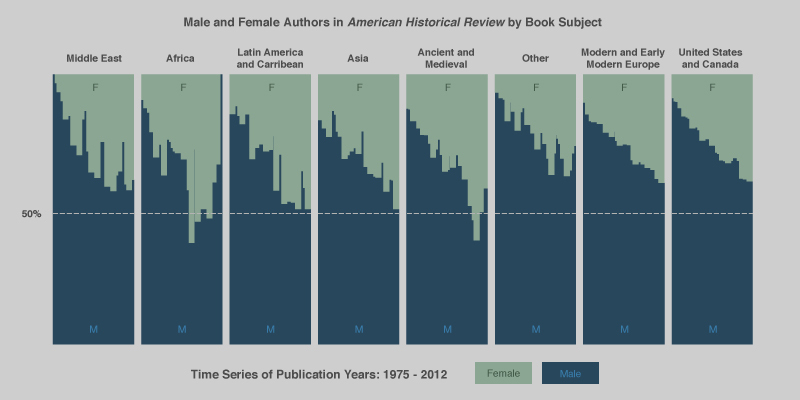 So the 1-3 year spikes in either direction might be a product of a small sample size – although the spike of female authors you mention in Ancient/Medieval does seem like more than just noise. What’s the population of books from which AHR draws its reviews? I think you need meta-data about author gender in that population. It looks like you tried to let completed dissertations stand in as a proxy for that population, but, if history is like English, most dissertations don’t turn into books that would be reviewed by a flagship journal. So, if the population of books from which AHR draws its reviews likewise has a 25-35% gender gap, that would explain your data regarding reviews in AHR. If, however, that population is equally split between female and male authors, then certainly that’s evidence for systemic discrimination in AHR reviewing practices. However, I don’t think you can claim that until you have more data, again, about the population of books from which AHR draws its reviews. I mention this because, in my sub-field of English (rhetoric), some studies on book and manuscript submissions have been done (see Groggin, Authoring a Discipline) and they have found that gender differences in publication reflect gender differences in submissions—something on the order of a 70/30 split at some journals. So, as you suggest at the end of your post, gender gaps in publications or in reviews of publications probably reflect how women are positioned in academia rather than any kind of systemic bias at the editor’s desk. Oops, sorry, forgot to escape the italics! Also forgot to mention that this is all excellent work, especially that Python script. Thanks for making it available! You bring up a really important point in that this is not a direct representation of books published, but specifically books reviewed by one journal – albeit one that claims to be “the only journal that brings together scholarship from every major field of historical study.” This is partially why I chose it.